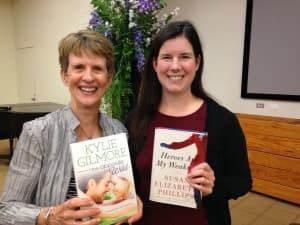 I got to meet one of my all-time fave authors Susan Elizabeth Philllips at her book signing! She writes some really funny, tender contemporary romances. My favorites are Nobody's Baby But Mine and Lady Be Good. I've read them multiple times and still laugh out loud. She's such an inspiration to me. And meeting her in person was wonderful. She was so much fun. I asked her for tips on writing the male POV. She said: Just live with some crazy men. Score! I'm all set.